CEDIA NEWS: The ultimate in 'private' home cinema | What Hi-Fi? Futuristic design icon or claustrophobia-inducing escapism? 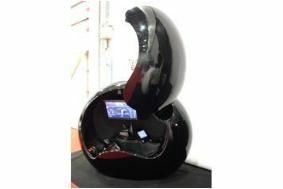 Either way, this incredible home cinema 'pod' from OV/E is a stunningly original approach to home entertainment. Of course, such a 'system' – if such a thing can be termed one – doesn't come cheap. There's plenty of scope for the individual buyer to choose the exact specifications. OV/E starts at around £50,000 and goes up to around £80,000. We'll take six, thanks. So, the personal home cinema 'pod' is here: is this the future? Tell us what you think.